The draft by-laws put out by Directorate of Municipal Administration Karnataka has omitted discussion on waste-pickers. “We are the people in the city who have been doing this (waste management) for a long time. Don’t do the tender. Give the job to us. 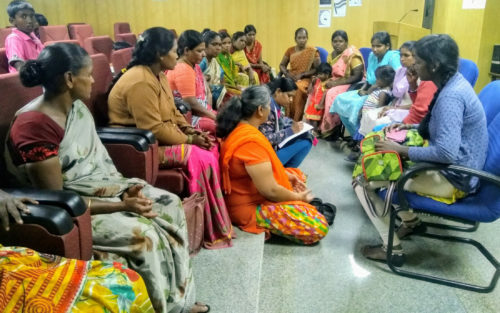 We have our own self-help group, if you give us the contract, we can take (waste management: door to door collection of segregated waste and processing) it up,” said Geeta, waste-picker from Mysore, in the state level consultation of waste-pickers on ‘Draft Solid Waste Management By-laws of Karnataka’. The consultation was organized by the Alliance of Indian Waste-pickers in collaboration with Hasiru Dala. The waste-pickers and informal waste collectors came from Bengaluru, Mysore, Tumkur, Nelamangala, Chamarajanagara. The proposed by-laws make a very minute reference to the inclusion of waste-pickers and their organizations, which seems to be mere lip service. The waste-pickers were visibly upset with the omission of waste-pickers and informal waste collectors in the proposed by-laws. If the by-laws go without discussion on the integration of waste-pickers, Karnataka will become the first and probably the only state to do so. The by laws of small towns like Tenkasi to Union Territory of Daman & Diu and Odisha’s model waste management by-laws and West Bengal Solid Waste Management Policy, all prescribe integration of waste-pickers. They quote the prescription of Solid Waste Management (SWM) Rules 2016 as a reference. The SWM Rules 2016, notified by Union Ministry of Environment, Forest and Climate Change (MoEFCC) outline the definition of waste-pickers, their integration, including the creation of self-help groups of waste-pickers and their participation in the solid waste management of urban and rural areas. The SWM Rules 2016 mandate the state governments and the local bodies to take initiatives in this regard. Under the rules, the state governments and local bodies are supposed to prepare action plans, strategies, and by-laws for solid waste management. To bring in uniformity across Karnataka, the Directorate of Municipal Administration has decided to draft by-laws at the state level. After the notification at the state level as model by-laws, these will be notified by the local bodies and implemented. It is important to mention that, the measures prescribed in the SWM Rules 2016 use the lessons learned in cities like Bengaluru and Mysore. The omission of discussion on the integration of waste-pickers from by-laws appears very strange and out of place, especially when Karnataka’s cities Bangalore, Mysore, Nelamangala, and Tumkur have taken many initiatives in this regard. The participating waste-pickers in the consultation said that they want the inclusionary measures as prescribed in SWM Rules 2016 be referred in the by-laws and detailed discussion on each of the possible measures of integration. During the consultation, they came together and put together a list of demands in the form of a letter addressed to the Directorate. The copy of the original letter written in Kannada and signed by the waste-pickers can be can be accessed here. 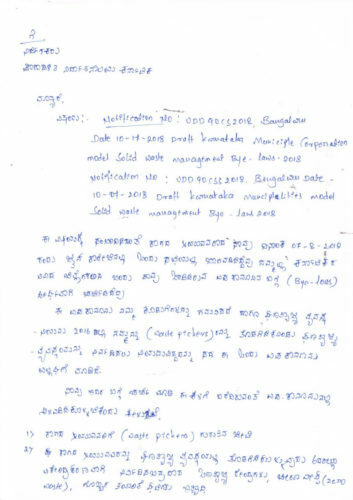 Extract of original letter sent to the Municipal Administration of Bangalore. Sub: Regarding- Notification No.UDD90CS2018, Bangalore Date 17-10-2017 Draft Karnataka Municipal Corporation Model Solid Waste Management By-laws 2018. Notification No. UDD90CSS2018 Bangalore Date 10-07-2018 Draft Karnataka Municipalities Model Solid Waste Management By-laws 2018. We wish to inform you that about the above notification, we the wastepickers participated in a meeting on 07-08-2018 conducted at Jain College, Palace Road, Bangalore. The wastepickers from different districts of Karnataka met here to discuss in detail on the Karnataka draft on Bye-laws. We understood in the present draft of By-laws that there is no mention of the contribution of our hard work. The Solid Waste Management (SWM) Rules of 2016 are violated under the above By-laws, which recommends our inclusion in SWM. Wherever there has been no earlier appointment of Pourakarmikas (sanitation workers), the waste-pickers be hired for sanitation work as the priority group. The translation of the letter was provided by Devaki H. Samuel.